Different types of chocolate contain various levels of fat, caffeine and the substances methylxanthines. In general, the darker and richer the chocolate (i.e., baker’s chocolate), the higher the risk of toxicity. 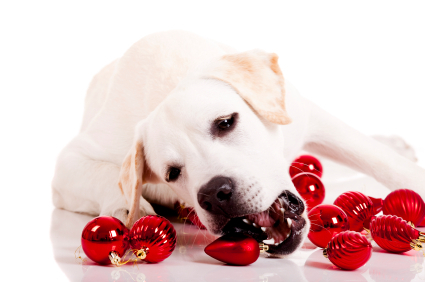 Depending on the type and amount of chocolate ingested, dogs might experience vomiting, diarrhea, urination, hyperactivity, heart arrhythmias, tremors and seizures. Fat trimmings and bones are dangerous for dogs. Fat trimmed from meat, both cooked and uncooked, may cause pancreatitis. And, although it seems natural to give a dog a bone, a dog can choke on it. Bones can also splinter and cause an obstruction or lacerations of your dog's digestive system. Keep your pet on her regular diet and caution visitors against giving your pet special treats or table scraps. 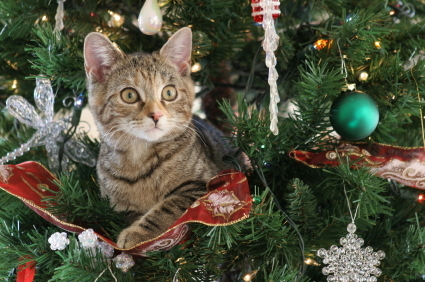 Taking precautions with pets during these festive times can help ensure that you and your family will enjoy a happy — and healthy — holiday season!